All Things Dark & Magickal: The Glass Watch by SF Benson is a delightful Cinderella retelling with a time travel and gender bending twist. Trevor wishes to attend the Institute of Prodigious Arts and for his magick to awaken so he can finally become a Spelltwister, just as he and his father planned. All this would come true if it weren’t for his wicked family. Since his father's death, his stepmother has stolen any wages he earns and spends it all on her extravagant tastes, his step-sister doesn't pass up any opportunity to torment him, and his half-brother has his eye set on Tamar, whom Trevor has secretly loved for years. When he's pushed into taking a second job as a chimney sweep and Tamar's set to announce her betrothed, which seems to be his half-brother, a mysterious woman appears and gives him a glass watch. He makes a wish to go far away and the wish comes true, just not in the way he expected. He finds himself in the 21st century where he becomes Trev, whose family has familiar faces and lots of secrets. In a unique twist on a classic fairy tale, SF Benson blends time travel with the wonder and danger of wishing for a new life. With a single wish, Trevor goes from 1838 to 2017 which reflects his own life where his family also exists but is a mirror image from Trevor's life with slight differences fitted to the modern world. His step-mother has the same extravagant tastes and in this life she's even in the spotlight, but she shows actual affection towards him and seems to be less wicked. His step-sister no longer lives to torment him but sees him as a brother. His step-brother remains wicked and is the only one whose name doesn't change between times. His father is only alive in the future reality, but by including him, Benson gives a glimpse of what Trevor's life is missing, even if it doesn't last. This future reality allows Trevor to walk in the shoes of another version of who he could be and, while the idealistic life he could have quickly takes a turn, he gets to see how potentially his own life could turn out. Benson incorporates several familiar elements of Cinderella, but everything has a fun twist to it. Tamar and Tamara take up the role of Prince Charming as in the past she's of a higher status and in the future she's famous. The glass watch takes the place of a glass slipper while Trevor's fairy godmother is Merritt, who isn't opposed to bluntly giving advice. These and other elements are woven together for a lesson in not allowing others to rule over your life and the pitfalls of getting what you wish for. Wishes come with consequences and are where the danger truly lies. In a world where anyone can wish, Benson explores how truly threatening a single wish can be and how not everyone wishes with the best of intentions. 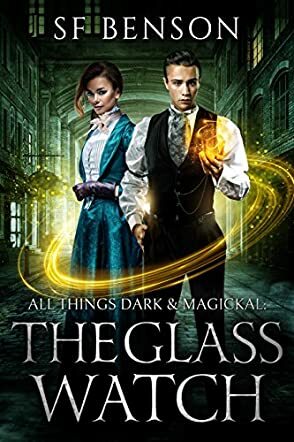 All Things Dark & Magickal: The Glass Watch is a unique take on a classic tale with a lighthearted tone, a sweet love story, a wicked family, a trip to the future, and plenty of wishes.